A reader left a comment on my site this week and asked a few question. Since blood type is connected to DNA, and your microbiome is connected with your DNA, I am not surprised. I suspect that in time we will find many conditions deemed to be inherited is not inherited by DNA proper, but inherited by microbiome. I include one of the diagrams from the article that you cited. I could not find any studies on fibromyalgia, CFS, IBS and blood types — it would be interesting to see a study on it! ABO histo-blood group might modulate predisposition to Crohn’s disease and affect diseasebehavior. Many probiotics help with serotonin, they tend to be the same ones that I suggest. “serotonin receptor modulators are used to treat IBS,” I did a post on DNA and serotonin earlier this year that may interest some. 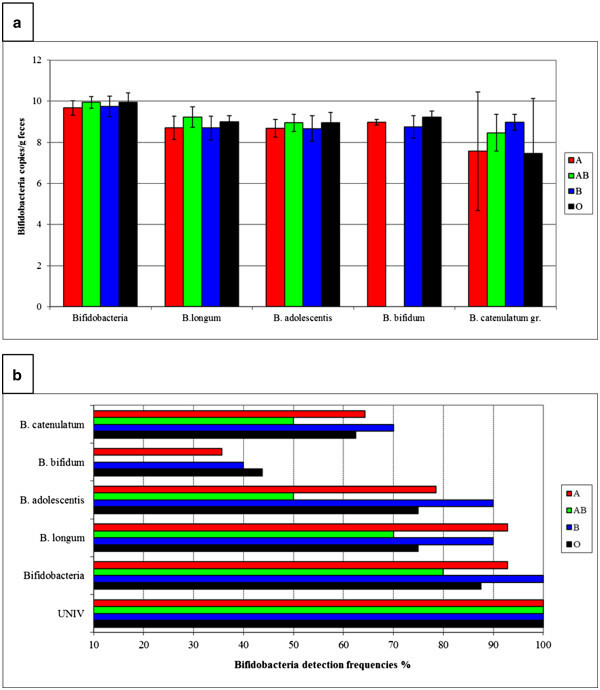 Lactobacillus rhamnosus GG supernatant upregulates serotonin transporter expression in intestinal epithelial cells and mice intestinal tissues . Melatonin production in Escherichia coli by dual expression of serotonin N-acetyltransferase and caffeic acid O-methyltransferase. Very glad that it is working and would love a fuller report — if you are willing to share with people. I apologise for the delay, I have a 5 month old daughter who doesn’t give me much time to sit and think, let alone write something! While the gut produces the majority of the body’s serotonin, it is the 5-HT receptors that mediate the reuptake (termination) of serotonin. When a person has has low levels of serotonin for a long period, the 5-HT receptors may continue to terminate serotonin at a rate that is excessive. Someone explained it to me this way (which I loved) – Imagine your body is a swimming pool, serotonin is people that are lining up to go swimming and the 5-HT receptor is a life guard. When the pool has had only a few people in it for a long time, the lifeguard thinks that this is the norm and will only ever allow a few people in the pool at once. The confused lifeguard keeps kicking people out as they jump in so they don’t even get to have a swim and the pool remains almost empty. A selective serotonin re-uptake inhibitor (SSRI) lets the lifeguard know that the pool can fit more people. This then allows the body can utilise more of the produced serotonin rather than terminating it. Basically, If the reuptake is too high, no matter how much serotonin your gut produces, it isn’t being utilised. Considering the importance of serotonin’s use in our body’s immunity, we really shouldn’t be wasting any! All of this was based on my theory of boosting my body’s natural killer cells with serotonin to control the EBV infection associated with my CFS. I found 25mg to be sufficient in my case. Combining your basic protocol and probiotic suggestions with serotonin reuptake inhibition, I have had great success and fast! Thanks again Ken for sharing your wealth of knowledge with the world. You deserve and award for everything you do! Thank you for sharing — and doing exactly what I hope would happen, take my model and other person/subset-specific treatment and combining them successfully. I keep droning on that it is a model and not a treatment plan. You got it and was successful! You did the final steps! Feel free to email me at Ken[At]Lassesen.com a history of what you have taken, responses, etc for me to share with the readers. The longer the better usually! Reading success stories encourages people to have hope and to incorporate some aspects. I just realised that I wasn’t clear but this is my second time using sertraline. The first time was 5 years ago and after 12 weeks, I had a 90% remission of CFS symptoms (but did not link it to the sertraline at the time). I stopped taking it after 9 months and remained at the same level of health for 5 years. 5 months ago, I had a major relapse after my daughter was born. After researching CFS and EBV treatments, I cottoned on and requested a prescription of sertraline from my doctor. I started the dose low and slow with virtually no side effects. What about those of us who have enzymes that clear serotonin slowly like MAOA and COMT. My understanding is that we can have too much serotonin because of slow clearance and therefore a build up. What is likely to happen when we modify our bacteria with say Symbioflor 2 and Prescript Assist plus taking Activa? After 5 weeks of this combo plus Neem/Oregano I have big changes in my brain’s cognitive abilities but it’s almost too much bordering on a hyperactive brain. Should one just lower dosage and timing of the probiotics? I have been taking either the Symbioflor 2 or Prescript Assist twice daily but I get a dose of the probiotic bacteria in Active 3 times daily although its only in small quantities. I guess all the changes are good but the brain thing is a bit too much! Be comfortable… To much of any thing, moderate intake or take a week break. I can see that it has all been caught up in a change of need for less thyroid medication which is possibly causing this. Looking back at my diary the first signs were after one week on the protocol but I missed them so carried on with my usual thyroid dose. Over time they have built up and got a lot worse (overstimulation). Now that I have realised this I have just started to cut back on the thyroid meds and it feels a bit more comfortable already but I will also ease off a bit on the probiotics just to be sure. I didn’t think that things could change so quickly in somebody who has been ill since 1979! Thanks for all the information Ken it almost feels too good to be true!